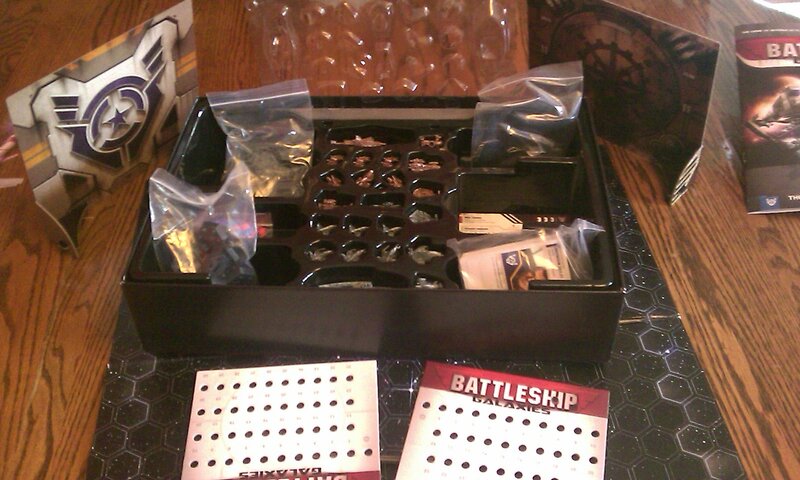 A week or so ago I received a very advance copy of Battleship Galaxies, one of the most anticipated games of the year, and from the time I opened the box I was mesmerized by the amount of time and detail that the folks up in Pawtucket have put into this game. I have to say that I’m utterly impressed. From the player shields that allow you to hide your reserve forces behind Saturn, to the well illustrated cards, to the great looking ships, everything is absolutely perfect. I’m not shocked, since these guys are the same ones who developed some of my favorite games such as Battleball and Heroscape, but since there has been very little in the way of press on this game, I wasn’t sure what to think. Now that I’ve played it over ten times, I can tell you without reservation that it was wholly worth the wait. Battleship Galaxies is nothing like the old Battleship game that every person not living in abject squalor has played at least once in your life. Oh no, this is not that game, not remotely. There is also the conjecture that this is just Heroscape in space, since Craig Van Ness was the principal designer along with two other Heroscape masters, Colby Dauch and Jerry Hawthorne. That, also, is absolute rubbish, and not only does this game not share much kinship with that particular game, it’s quite unique when viewed against other space-based tactical games, other than the concepts that have been around since H.G. Wells and the like had first envisioned travel through the aether over a century ago. The concept of this game is that a race of sociopathic, warmongering space pirates, the Wretcheridians, colloquially known as “The Wretch”, have decided to enter the Sol system from their native Eridani system and start taking things that don’t belong to them. As usual, the forces of Earth are the only thing stopping them from wiping humanity from the face of the universe. It’s a space-based tactical fleet combat game that has managed to build in aspects of deck building, resource management, hand management, and a single ode to the original Battleship game, an alphanumeric set of dice that determining whether you’ve hit your enemy or not. As Luke, Dale, and J.P. from the Opinionated Gamers said when they played my copy, no more can you say, “You sunk my battleship!” Saying, “You sunk my F-51 Blue Sparrow Small Fighter” simply doesn’t roll off the tongue as easily. Players select a side, choose a fleet size, and then choose their ships and tactics cards in order to prepare for battle. Every decision, from the minute you choose a side, makes a difference in this game, and what truly makes it special is that it’s not simply a toe-to-toe blunt force combat game, it’s far more about making executive decisions at the right time and utilizing what you have in the most valuable way you can. Before I get into how this game is played, since I know there’s very few souls out there who have seen the rulebook, let alone the game, let’s talk about the bits. From the box lid to the blow-molded insert, everything is, in a word, magnificent. The theme is as strong and integral to the entire game as any game I’ve played, and it even comes with a cool comic book that explains the backstory that you can read while you’re sitting on the can. Trust me, after you open the box, you will need it because there’s a good chance that some people will soil themselves. I know I nearly did. The art is absolutely outstanding in almost every instance, and as a sci-fi nut who has a small shrine to the Emperor of Mankind in his closet, this is saying quite a lot. Let’s not get off-track yet, though. Let’s talk about bits some more. Inside the box are about 30 ships, almost all of which are unique, and they’re all very nice models, painted with a basecoat and a nice wash to bring out the details. There’s three sizes of ship, and these are supported by three different base sizes that range from seven-hex to one hex, with the medium and small being secured to the base by a very clever and durable ball-in-socket retention method. This allows you to pose ships in all manner of directions, such as a banking maneuver, or having a fighter fly up under a capital ship to deliver a death blow. In other words, there’s a bunch of cool little toys in the box. Add to this that the bases hold the bright red and blue shield and damage pegs, helping identify strong or damaged ships easily on sight. Then there’s about 100 tactics cards or so, most having three copies each, with half applying to each faction, as well as two reference cards. These cards are all very nicely illustrated and tie into both the theme and the comic book, so for those who took the time to read it, you’ll get a sense of ‘caring’ about the characters in the context of the overall story. The purpose of these is to recreate events on the battlefield, such as attaching a flag officer to a ship to provide a command bonus, or to equip a ship with extraordinarily devastating ordnance, to send an away team to sabotage or board enemy vessels, and other such things. To add to the goodness in the box, there’s these two really well built cardstock shields that provide you a way to obscure your forces to recreate a skirmish where neither side knows the force strength of the other. There’s two large, quad-fold boards that can be played separately or laid together for larger playfields, both of which are nicely illustrated with space scenery such as nebuale and stars, as well as having marked spaces for nicely illustrated, and varied, tiles that are laid face down and provide boons or hazards during gameplay. There’s also two energy references that are accompanied by two thematic pegs with which to track your fleet’s shared pool of energy. The purpose of this is to limit what a fleet can do on its turn, and the design is such that it’s very simple to track. Some of the last bits are the two dice, one of which is a standard D8 die, and the other is a custom D10 die printed with the letters A through J. 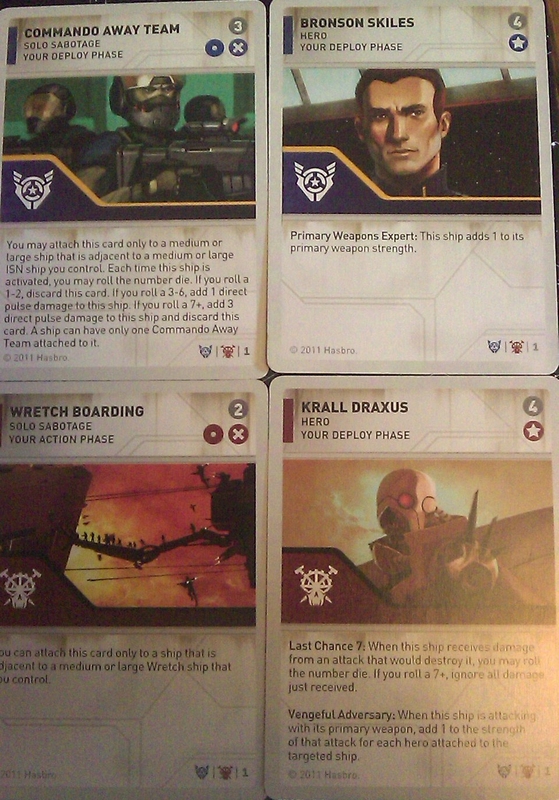 When rolled they assemble a value which can be cross referenced to the last bits in the box, the ship cards. Most ship cards are double sided, with varying degrees of strength printed on either side as defined by the ship’s level, Standard, Seasoned, or Veteran. Included on these very well designed, easily understandable cards are charts with illustrations of the represented ship. This chart is made up of an alphanumeric grid, and during an attack, if you roll a value that has the ship’s outline within, highlighted by a grey background, then you’ve successfully hit it. There’s also a critical space illustrated on the grid which indicates the ship’s weakest point, and if you happen to nail that spot when its shields are down, that ship is immediately eviscerated. 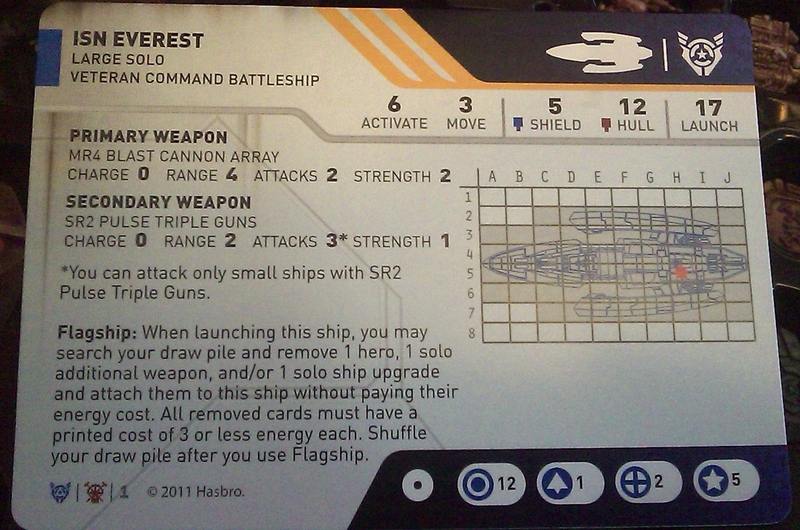 Each ship also has its weapons loadouts and special abilities, if any, listed, in very unambiguous and clear text, which clearly is influenced by the Heroscape design experience that these designers all shared. In this day and age of nearly unfathomable game rules, this is a breath of fresh air. It’s about time someone started making rulebooks that don’t require sixteen pages of errata on the company website in order to play. The back of the manual has eight built-in scenarios that are both challenging and interesting, and vary from the simple decisions of your starting fleet all the way through giving both sides a relatively complex objective and leaving it up to the players how to best achieve it. From top to bottom, this is a very well designed game. Finally, I should note that you can only have one named ship on a side, so not only is this not a collectible game, there is no real draw to go out and buy multiple sets of this in order to enhance the experience. It’s completely stand alone, and there’s no more you need to buy to make the game better. Well, that’s until the almost-certain expansions hit the shelves, but quite honestly, there’s enough game in this box as-is that I think it will be a good while before you’re clamoring for new units and tactics cards. I’d also be surprised if a crop of Hasbro-created and fan-created scenarios didn’t start popping up all over the place. The background comic underscores how cool a story the game surrounds, if a little cliche in concept yet strong in execution, and I’d really like to see how it plays out. As a total Star Wars nerd and a disciple of the Emperor of Mankind, I was a little unsure of how I’d like the story since Star Wars is one hell of a hard fictional universe to compete with, but the comic, the cards, and the ships all have done an excellent job of keeping me interested. Now that you know what’s in the box and a little about the game, let’s talk more about the gameplay itself, because nice bits are nice to look at, but they don’t always equate into something I even remotely want to play. Luckily, this game has been like heroin to a junkie for me so far, with no sign of letting up. 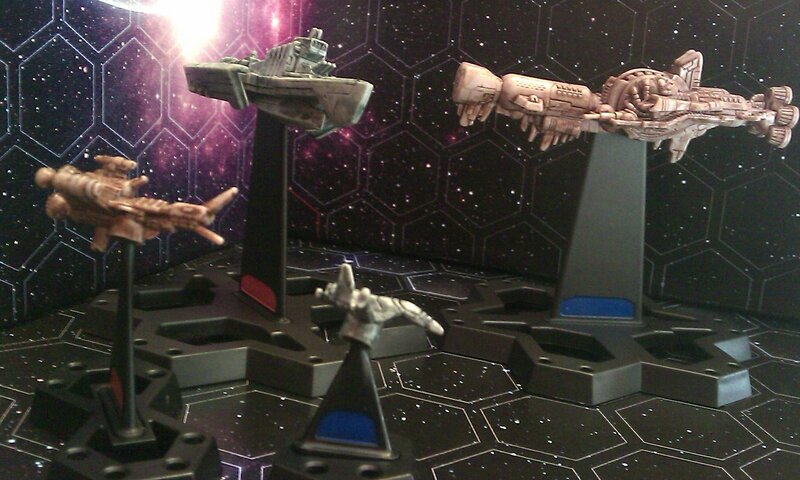 To set up the game, either two to four players decide what scenario to play and what the fleet starting size is. This is the combined launch value of each ship’s card that indicates how much energy it costs to launch it from your reserve into battle. A typical amount might be around 50 points or so. After this is decided, each player or team will choose to play for the noble humans or evil Eridani invaders, and using the points cap they will select the various ships and strength levels in their fleet. 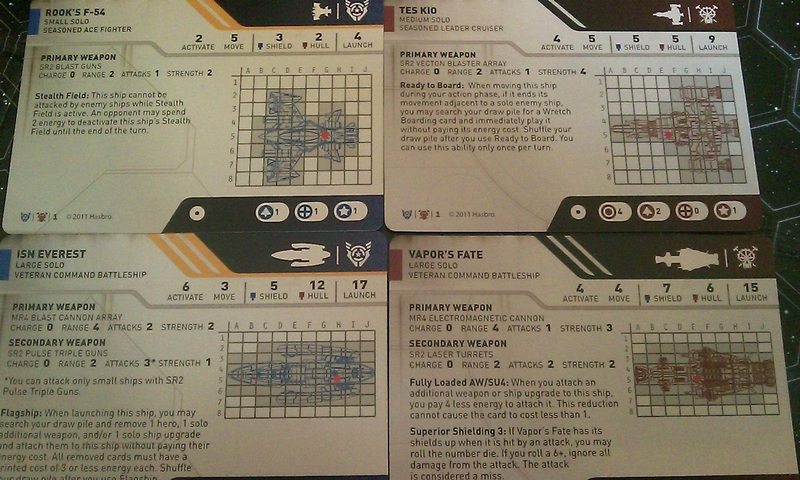 After their fleet has been assembled, the players then choose the tactics cards they wish to build into their deck. The limit on these cards is half of the chosen fleet strength, so if you have a 50 point match, each side will choose 25 cards for their deck. Regarding fleet and card choices, there are finite limits on what you can do. You can never have two of the same ships on the same team, so if you wanted to have two squadrons of a type of fighter, it’s not going to happen. Further, you can only have three of any copy of a card in your deck, and even then there’s some limitation on how many of a unique card can be in play at once, so you really have to plan for the strategic options you want to have before the game ever starts. Add to that that some ships have a capacity level and can act to carry smaller ships into battle to launch them into space at the optimum time, and you really have a huge variety of strategies that are viable. Now that a fleet’s been selected, the rubber hits the road. Each team draws five cards from their deck, with the ship cards and models hiding behind their shields, they determine who plays first. The first team or player will move their energy marker to five and the opponent will move theirs to ten. It’s at this point that the game begins in earnest, and the bloodletting can now ensue. Players’ turns are in order, and always have three phases to complete before ending their turn. The first phase is the energy phase where players add ten energy points to their counter and draw a single tactic card from their deck. There is a hand limit of ten cards per side, so if you’ve hit your limit, you aren’t allowed to draw a new one. Going back to the use of tactics cards, these can be played at whatever time is specifically listed on the card, so players need to keep this in mind so they don’t forget to play a critical card and lose an opportunity. Another key point is that cards often cost energy to bring into play, so the smart admiral will keep a small reserve of energy to be sure to be able to play a card when they wish. The second phase of the game is the deployment phase, and this is when ships are launched either from the reserve or from a carrier onto the battlefield. To do this, players simply look at the ship’s card that they wish to deploy, reduce their energy amount by that value, and then place it on the board. 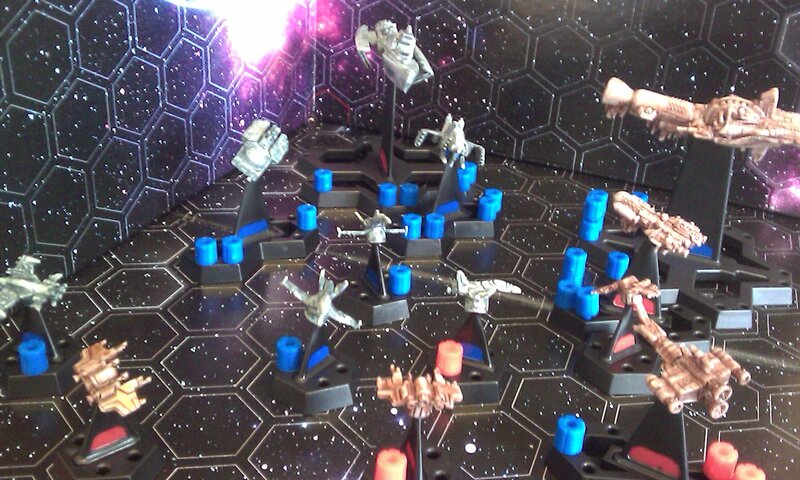 Ships coming into play from the reserve start on the back starting line of the playfield, which is highlighted white, and ships launched from a carrier are put into play adjacent to that carrier. A very slick mechanism for launching loaded carriers is that behind your screen, without announcing it, you can place all carried ship cards underneath the launched carrier card, which is placed near the playfield so that all players can see it. I’ve effectively used this to launch surprise attacks, drawing in enemies to my capital ship while subtly reserving energy for the planned counterattack. It’s devilishly satisfying to have your opponent believe that you’ve left yourself exposed, drawing them in for the anticipated death blow, just to launch two squadrons of fighters and a frigate, causing the opponent to loudly utter words not actually listed in a Miriam-Webster dictionary. 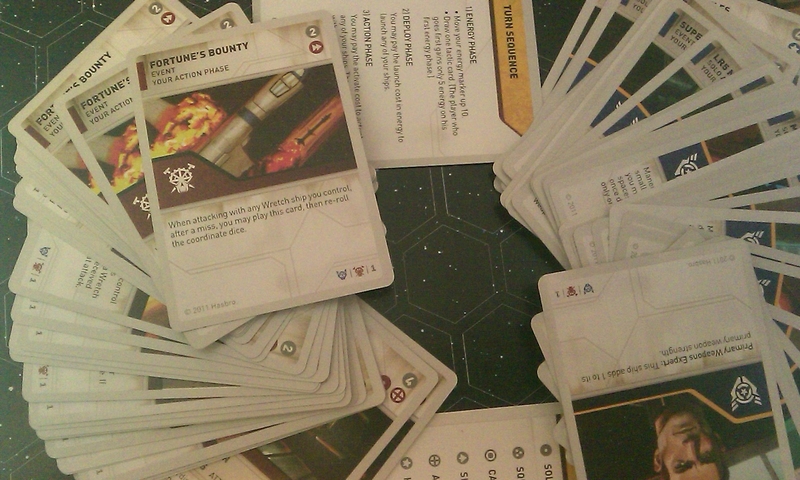 The cards are reasonably thin, and if you line them up to hide the transported ship cards, it’s one hell of a way to ruin a buddy’s day. On the downside, if your carrier is destroyed before you can launch your fighters, all hands are lost. Once the deployment phase is done, players can now start the activation phase, and that’s where the plaxma (yes, plasxma, not plasma) bolts start to fly. Each ship has an activation cost, which again is noted in energy points, and a player will activate each ship they elect to in turn, moving and attacking with each. Each ship has a move value associated with it, and once it’s been moved if the player chose to move it, you can check each weapon’s range on board to determine if they have a valid target. If you can attack, you can use all weapons on board that are within range to attack, and to do this you must spend energy to charge them. The charge amount is listed on the card, and all of the stock weapons have a charge value of zero, so you get free shots if you use only your stock weapons. 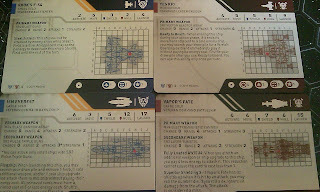 Tactics cards can be attached, as noted, and some of these act as secondary or tertiary weapons which do require a charge to fire. Regarding movement, a key strategic aspect is the effects of Electronic Countermeasure damage. If any ship comes in contact with an enemy ship, the player who was approached may roll the D8 die, and on a roll of five or higher, the encroaching ship takes damage. Damage is dealt depending on size, with large ships taking three damage and small ships only taking one. Certain ships are immune to this, and these make fine boarding vessels, provided you have a sabotage card in hand and the energy to activate it. Some weapons allow for more than one attack, and players can attack any valid target they wish so they’re not locked into attacking a target with a weapon that has multiple attacks if you anticipate destroying it on the first shot. Also, some weapons have limitations or bonuses against some targets, such as a point defense cannon array that can only attack small ships or a weapon that passes shields and deals direct damage. Some ships also have powers that affect targeting, such as the Wretch fighters that can’t be attacked by nonadjacent ships when adjacent to an enemy ship. Others have powers that affect range and strength of attacks, so when developing a fleet and tactics deck it’s imperative to consider these powers, as well as card powers that can affect targeting and damage. As noted, for each attack you make you must roll the dice. 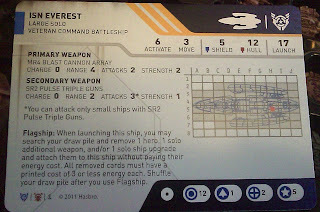 Your opponent will then refer to the target ship’s card and determine if it was a hit or not based on the schematic grid illustration. If a shielded ship takes damage, you simply remove the blue shield markers from that ship’s base, but if it’s shields are depleted, you place red damage pegs on the base. If a ship has exceeded its hull value, it is utterly destroyed and removed from the playfield. Again, if an unshielded ship takes a critical hit based upon the hit location rolled, that ship is instantly blown into a fine powder, with all hands lost to a vacuumy grave. Play continues with each side taking turns playing their phases until either the scenario objective is completed, one side is completely devastated, or if both sides have run through all of their tactics cards twice. I should mention that when you run out of cards the first time, you simply shuffle your discard pile, but if you run out again, you’re out of luck for the rest of the game and cannot draw any new cards. In the case of a premature end due to running out of cards, the player with the highest combined launch value of all remaining launched ships is declared the victor. In the final analysis, I can say that I unequivocally, absolutely adore this game. 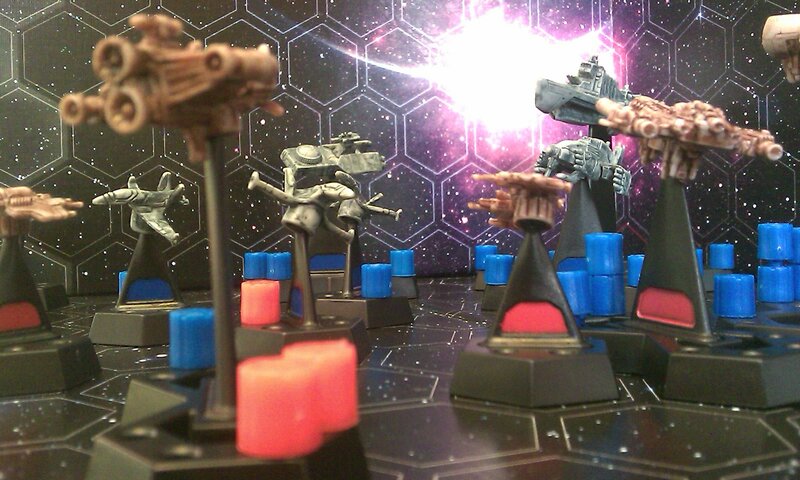 It does almost everything I want a space battle game to do and it has little in the way of worthless chrome rules. I’ve played everything from Star Wars Miniatures Starship Battles and Hard Vacuum to Battlefleet Gothic and Starmada, and this one is hands-down the most fun to play. I would put this up against its so-called peers any day of the week and I’d bet good money that the opposition would lose that Pepsi Challenge all day long and twice on Sunday. The bits, the theme, the rules, the art, and everything about the game screams to the heavens that it was well tested, well balanced, and has been put through the wringer to render off all the fat, leaving it a very lean, very approachable light tactical war game that will stand the test of time. If you like space fleet games, and you’re sick of spending 10 hours simulating a battle between two fighters, this is totally the way to go. Hell, if you like ANY tactical light war games, this is the way to go. It gets virtually everything right, and everything the design attempts to do it does exceedingly well. If you have money to spend on a game in the near future, this is the one. I’d love to tell you where to read the rules, or learn more, but you’re going to have to wait because it’s not on the Hasbro site yet! 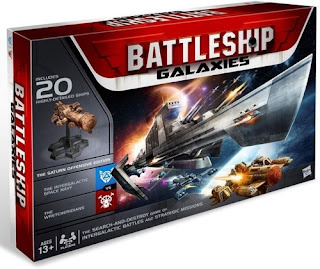 For the time being, check out the Battleship Galaxies game page on http://www.boardgamegeek.com/! As soon as this is released, if you want to give it a try without dropping the $50.00, try http://www.boardgameexchange.com/ and rent it, or you can pre-order it right now at http://www.coolstuffinc.com/! Nice review!! Hopefully we can get a game or two in next week! Great review Pete! This game has gone from not on my radar at all to a must buy. What sort of time does a game take, and what other games is it similar to in complexity? I ask, because while I don’t care myself – I’ll be getting a copy anyway – I am also thinking the kids in my school’s lunch time games club would absolutely love it. But complexity and play length are factors I need to consider! Would it work combining two games to create an even larger battle? Not really unless you house ruled that you can have more than one of a ship/squadron. Just wait…if you knew what was coming up you’d totally forget the idea of needing 2 sets of this.